Hello and a belated Happy New Year to everyone. I hope 2015 is being good to you so far. It has been for me. January is a month of celebrations at my house. Herman had his birthday on the 18th, and went for a car ride with Dori to DQ for ice cream. He also got two fish bowls and will get his Betta fish this weekend. Dori and her dad, Nikolas, celebrated their 2 year gotcha day on the 23rd, and Opie celebrates his 7 year gotcha today, the 28th. I guess you're wondering why I have stopped blogging. Well, writing my book, FINDING MYA, took a lot of extra creative work, and left me with no time for much else. And then Christmas came, and I drove up to Michigan with my husband and Herman to be with family. And when we returned home, I went right back to work. This time I'm working on a brand new website. I hired Janeson Keeley from JTKweb to design a professional website, and as soon as I finish writing content, Janeson will put the final touches on it, and then I will have a launch pawty. Herman's domain, www.wonderpurr.com, will be redirected to my my domain, www.kimberleykoz.com, so it won't matter which domain you use. I'm super excited about the new website. I'm a storyteller and that's what my website will be focused on. Telling stories. Funny stories that will hopefully entertain and make you laugh out loud. All of the interviews posted on both domains will be available on the new site. And I will also continue to review pet products, but with a novel twist that has my contact at Chewy.com and the editor of Catification, the book written by Jackson Galaxy and Kate Benjamin, super excited. Sorry, no hints. You'll just have to stop by and see what that novel twist is. 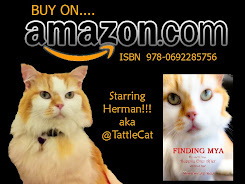 TattleCat Chat - Herman has an opinion on everything, and this will be his column where he can talk about world events, traveling with Ray and I, his appearances at Blogpaws and book signings. Plus he will probably do some gossiping about what goes on at my house. He's not called Tattle Cat for nothing. Cooking Wif Gidget -- @ChefGidget returns with recipes from the cookbook I kept when I was a Florida restaurateur. Ask the Cat Magnet - I just had to do this. I've rescued 70+ stray cats in my lifetime, and have become the go-to-purrson (sorry!) on cat advice for friends, family, and complete strangers who mysteriously get my phone number. I can speak on a wide range of topics from behavior (both good and bad), feline quirks (why they do weird stuff), and how to rescue a stray with trust issues, especially if they're feral. I won't advise on health problems, however, so please consult a professional. You can click here to send your question. Please put Ask the Cat Magnet in the subject header. Adorapurr Answers - Dori is such a copy cat. When she heard I was writing an advice column, she wanted to write one too. I'm skeptical about how she can give advice when she's only two. But if you have a problem and are willing to risk advice from a kid, then click here . Please put Adorapurr Answers in the subject header. And don't blame me if she ruins your life. 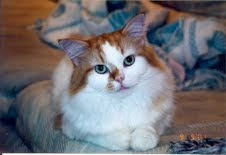 The rest of the Wonderpurr Gang -- Peaches, Chauncie Marie, Jack, Opie, Nikolas, Jesse and Frank -- will add their ex-purr-tise throughout the coming year, so stay tuned. There will also be three really super great features on my new website, and I've kept these for last. Sherlock Herms - Herman is a fan of classic movies like The Maltese Falcon, The Thin Man, The Hound of Baskervilles, and The Spy Who Shagged Me. So he's opened a detective agency, and you can read his adventures in a monthly series that will debut when the website launches. Club Wonderpurr - It's fabulous to belong to an elite club, isn't it? Especially one without membership fees. When you add your email to my mailing list, you will receive a seasonal (4-per-year) mewsletter with Herman as the Edipurr. You will also be sent a secret password that will allow you to enter Club Wonderpurr, a special place on the website where you will find lots of fun stuff that only club members have access to. Things like contests with great giveaways, excerpts from upcoming novels and the photos that inspired me to write them. Plus you will get a behind-the-scenes look at my Author Life, and stories with private photos of The Wonderpurr Gang. And that's not all. You will also have access to The Whiner, my diary revealing my fish-out-of-water adventures in rural Kentucky, complete with a house known as The Money Pit and a private cemetery that was reputed to be haunted. It's also where I nearly divorced Ray, increased my cat collection, and had a riding mower commit suicide. I hold nothing back, including unknown details about how Herman blew into my life during a blizzard. Hopefully you are now excited about my new website. When it's ready, I will have my cats yowl from the roof top so you won't miss the big launch party, complete with giveaways. Until then... as Herman would say... Have a Wonderpurr Day! I'm looking forward to your new site too. I hope I can find you. I haven't been very regular at posting and reading.